Everyone loves cookies any time of year! They’re great for any occasion, and they come in such variety that there’s sure to be at least morsel to please everyone. Here are a few of our favorite places – new and old – for cookies. Where do you like to go? Two relative newcomers are serving up delicious cookies. Laughlin’s Bakery in the Short North has already made a name for itself for its European cakes, breads, and scones. Not to be missed are the madeleines, or the macadamia nut cookies. Acre Farm-To-Table in Clintonville complements their menu of bowls and wraps with sweets like the double chocolate, ginger chew, and not-to-be-missed sweet corn cookie. Cravings Carryout Cafe may focus on sandwiches, but you can’t walk away without one of their milk chocolate pretzel or blueberry goat cheese cookies. Want to bring the cookies to you? 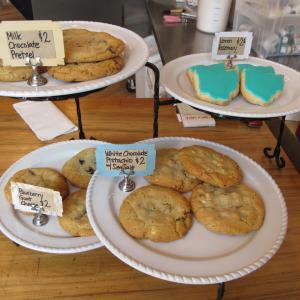 Rogue Bakery offers cookie delivery. You’ll love the creative and snarky labels just as much as you’ll love the cookies, like the I’m Not A Snickerdoodle or the Cornflake Marshallow Chip. There are even gluten free vegan options, like the Ancho Peanut Butter. For the more adventurous there’s even the savory Buttermilk Ranch cookie. Sassafras Bakery is a perennial favorite, with their snickerdoodle and salted chocolate chip cookies, and even their milk and cookies happy every weekday from 3-5pm. Buy a cookie and get a glass of Snowville Creamery milk or a cup of Cafe Brioso coffee for free! Speaking of classics, don’t forget old school bakeries like Resch’s Bakery or Schneider’s. These long-running family-owned shops are known for their donuts and breads, but easy-to-love cookies like chocolate chip, sugar cookies, and oatmeal raisin are sure winners. You can also order cookies in different shapes, too, like smiley faces, flowers, footballs, or the Ohio State Block O. Don’t forget to grab a carton of milk at Schneider’s, too! 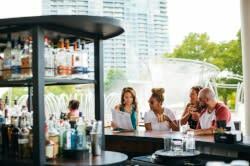 If you’re going gluten free, you certainly won’t go hungry in Columbus! Rogue Bakery and Pattycake Bakery have you covered, and so does Bake Me Happy, with their Peanut Butter Burners, Quinoa Flake Monster Cookies, and Sweet and Salty Dark Chocolate Chippies. All gluten free! That’s just a sampling of Columbus cookies. What are some of your favorites?